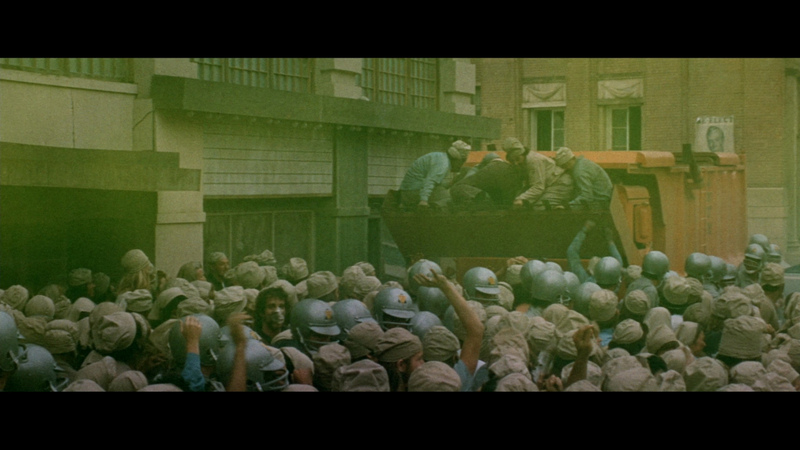 I first saw Soylent Green 10 years ago in a film class at summer camp. I was lucky enough to see it for the first time without knowing the ending, which definitely freaked me out. I remembered the colors and the riot scenes more than anything, which are still great. But watching it again, the story is really the best part. Robert Thorn (Charlton Heston) is trying to get to the truth, but the truth is something that is making people insane/kill themselves. He talks to a priest whom he knows knows the big secret, and the priest acts, looks, and speaks as if he’s completely lost his mind and is only barely a person. Thorn’s best friend, Sol (Edward G. Robinson) learns the truth and it prompts him to get assisted suicide. Of course, the big truth is that the government-issued food rations that this future United States lives off of is made of dead humans. If there was anything that would make people go crazy or kill themselves, that would probably be it. It’s just interesting to me that a simple fact can make characters do this, and it’s believable. But probably the best scene in the whole movie, or at least the most moving, is Sol’s death. The assisted suicide center that he goes to gives him a seemingly painless poison, and while he waits for it to kick in, the room turns his favorite color, they play his favorite music, and they surround him with video scenes of nature that don’t exist in the world anymore. He watches and cries, and Thorn watches and cries from an adjacent room. It’s really scary, beautiful, and sad. I was expecting to hate this movie and be disappointed that I wasted my time. But this movie is weird. And in a great way. I also didn’t realize it was in some future. I guess I thought it was just supposed to be….I have no idea, but it was compelling all the way through even though I knew how it ended. I like to think that Charlton Heston’s character and his roommate were actually married. It made it pretty interesting if you started thinking that throughout. Much like thinking that Cora is Mr. Brown’s caretaker instead of his daughter. Also, the old man looks like he should be in a Dr. Slump comic or something, I think it’s the suspenders and beret though.